For the past six months, Queensland Academy of Creative Industries (QACI), the new Creative Industries focused 'smart school' located at Kelvin Grove Urban Village have been collaborating with ACID on the Network Jamming project. A group of Apple Angels, as the school's innovative Macbook using students are called, have been testing various iterations of the jam2jam software and giving feedback to the team about design and application features. QACI are one of seven schools around the world selected to take part in these trials. The international schools are in Manchester in the UK, Malmö in Sweden, and Urbana Champaign (Illinois) and Lowell (Massachusetts) in the USA. Australian schools include MLC School in Sydney, led by composer James Humberstone and working with ACID partner University of Technology, Sydney and Strathcona Baptist Girls Grammar School in Melbourne working with Dr Tim Kitchen. The project team has been excited about the range and depth of the feedback coming from these innovative teachers and dedicated researchers all over the world. Project research assistant, Thorin Kerr, has worked tirelessly to build in some stunning new features to jam2jam to enable students to jam with their own visual materials like VJs and add cool dance music audio jams. We have had some amazing intercontinental jams between Sweden and Australia at ungodly hours of the day with amazing results. Network Jamming project leader, Steve Dillon, was recently asked to talk about design at the launch of QACI's Smart State Designer of the Year Award where the school is working with industrial designer, Rob Geddes, winner of the award. "Rather than use Powerpoint I decided to use the new features of jam2jam and let students jam with the visual and audio content while I talked about the project," Steve said. 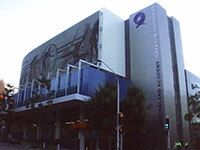 "The event took place in QACI's new, state of the art seven-story building in a great theatre space. The audience were able to view the presentation, with each jammer on a separate video screen, and hear the grooves pumped out of a house sound system." Year 10 and 11 students at QACI will now act as artists-in-residence at Rainworth State School and use their laptops with primary students to create performances for the Ideas Festival. The primary school students will present visual materials about the history of their location in jams at the festival. Network Jamming is providing amazing environments for students to express musical and visual performances and each of the trial sites are contributing critical design and feature information. Pre-service and practicing teachers have been developing innovative new pedagogy for the new instrument at the Jamnation site. They share different project ideas for Network Jamming and interact with each other to discuss the applications and approaches to teaching and learning with generative instruments. 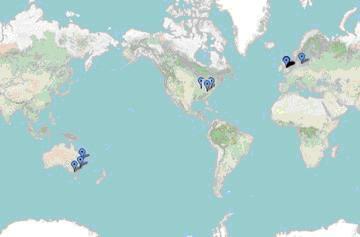 At present the Network Jamming team are planning an International Workshop in August called JamSkölan (after our Swedish participants — 'skölan' is Swedish for 'school') to celebrate and share our discoveries and showcase our development. ACID is reviewing and redesigning the ABC Pool site, a social media project developed by ABC Radio National. 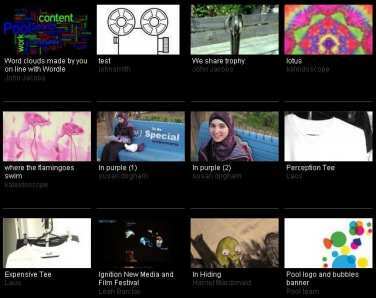 ABC Pool is a networking site for creative practitioners in the digital media and technology community. Pool operates as a networking and working space for behind the scenes exposition and discussion of ideas, practice and creative production within the community. This project will undertake a holistic review of the current site to build a coherent understanding of the strategic objectives of various stakeholders, and define functionality and designs to align Pool’s user experience with these identified objectives. The project will research the application of social networking technologies and user generated content (UGC), as well as their effect on changing media audiences, changing production processes and frameworks, education, and visual aesthetics for the site. Marius Foley and Chris Marmo (both from RMIT University) spent the first half of this week in Sydney interviewing key stakeholders for the Pool project with the ABC. In the previous week we sent out an online survey to Pool users, with some great results. You can find out more about the project at ACID's Pool project blog site. The Loupe project held a reporting workshop at RMIT University last week. It was an opportunity to gather the whole team together for an update on the progress of the project. In the six months since the last workshop, the ACID and Deloitte Digital sections of the project team have been working on different aspects of the project. ACID team members had been conducting research into the different types of user experiences inherent in social spaces and how visualisation could fit into this. The outcome of this was creating a model of an interface for a social environment that used visualisation, and extracting interaction design patterns that could be used to build this. The Deloitte Digital team had been working on the backend, developing several platforms that may bring about new opportunities for their business, and enable them to better understand their customers as well as provide more relevant services to them in an online setting. ACID team member, Nifeli Stewart, had been 'embedded' within an accounting team at Deloitte Digital, and reported back on two weeks of observational research. Her work uncovered some interesting findings about the way teams within Deloitte Digital operate and interact. These have implications for the next phase of the design of the system, and will ultimately be encapsulated in personas and scenarios for the next phase of the frontend design of the systems. Ultimately the workshop was a great success, with everyone gaining a greater understanding of what had been achieved in the project thus far, and a sense of the challenges in the next phase of the project which have implications for the way the system is designed. The team are now working on a website to describe the visualisation design patterns and a number of publications which explore visualisation on the social web for Interactions Magazine and Johnny Holland Magazine. Jeremy Yuille is from RMIT University and is the project leader of ACID's Loupe project. He is also a director of the Interaction Design Association (IxDA). 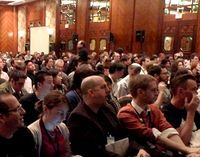 In February the Interaction Design Association (IxDA) presented their second annual conference, Interaction '09. Held in Vancouver, the conference spanned five days of workshops and presentations covering a diverse range of topics related to the practice of interaction design. Rather than tell you what happened, I thought it might be interesting to point to some of the content IxDA are releasing and wider community responses to the conference. ACID was a proud sponsor of Interaction '09, and I had a lot of conversations with people about the work we do, the approaches we take to educational engagement in particular. Here are some reviews from Johnny Holland, The Cooper Journal and a great round up of blog posts by Will Evans at Semantic Foundry. ACID's Education Day for 2009 was held on Friday March 13th. It was a great opportunity for all ACID students to meet, discuss their work and participate in planning education activities for 2009. We were excited to welcome new students but also to encourage many of our students in the completion and submission of their theses in 2009. Some highlights of the day included a session facilitated by ACID experience designer, Ali Kerr, helping students to translate their research to a broader audience, and a presentation by Mia Thornton, a past ACID student. Mia presented on her journey in the digital humanities from ACID to her current roles as PHD candidate at the Australian National University and her work at the National Museum of Australia. The next student gathering is planned for 1 May at the University of Technology, Sydney. ACID students from other universities will join us by Access Grid. 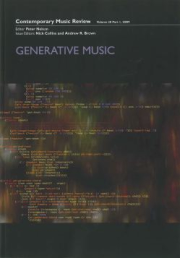 A special Generative Music issue of the Contemporary Music Review, co-edited by ACID Research Manager, A/Prof Andrew Brown, was published earlier this year and includes a chapter on Interacting with Generative Music through Live Coding, co-authored by Andrew Brown and fellow ACID researcher, Andrew Sorensen. Contemporary Music Review is a journal for contemporary musicians and provides a forum where new tendencies in music can be discussed. In Interacting with Generative Music through Live Coding, the two Andrews focus on performative interaction with the composition of generative music, and discuss how the live coding of music involves the building and management of generative processes. They situate live coding practice within historical and theoretical contexts and ground the discussion with regular reference to their experiences performing in the live coding duo aa-cell using Impromptu, an OSX programming environment for composers, sound artists, VJs and graphic artists with an interest in live or interactive programming. Andrew Sorensen is also the leader of ACID's Adaptive Media project, which is focused on increasing productivity for the provision of interactive entertainment through new adaptive music processes, and increasing access to interactive media experiences through the application of generative and self-organising media systems. Developed by Adaptive Media project leader, Andrew Sorensen, Oscilating Rhythms is a powerful new musical tool for Mac OS X providing a completely new approach to rhythm generation. An Apple 'Staff Pick,' Oscillating Rhythms is a generative tool designed to produce drum patterns by leveraging the power of simple oscillators. Oscillators are used to control all aspects of a performance including pitch selection, velocity, timbrel change and modulation. The reason that oscillators are such useful tools for producing musical material is their inherently periodic nature. By combining oscillators controlling pitch, rhythm and timbre and providing very precise control over each oscillators period, phase and amplitude it is possible to build rhythmic patterns ranging from the subtle to the outrageous. It's a rare occurrence that I come across an app that really impacts my daily workflow, but two little progs have recently become indispensible components of my desktop productivity suite: MaxTo and Fences. MaxTo is a lightweight taskbar app that enables you to easily set regions of your desktop to which you can maximise windows. This means that instead of expanding a window to completely fill the screen it will expand automatically to fill, say, only half. You can set up two region profiles as well as revert to default behaviour by holding shift. If you regularly find yourself working on multiple documents at the same time and don't have more than one monitor, this can be a tremendously handy tool. Fences is an app that runs in the background and helps you to corral your desktop icons into meaningful groups. Upon installation it will set up some standard boxes to keep your icons organised, but customisation is easy, allowing you to add, remove, move and resize your 'fences'. The real boon for clutter-phobes like me though, is that a quick double-click on the desktop will hide all the little critters leaving you with a beautiful, unblemished workspace. I hope you'll find these apps as useful as I have. If you have any questions, suggestions or comments, please send them to me at techsupport@acid.net.au. Litmus is published fortnightly by the Australasian CRC for Interaction Design. Anyone can contribute by emailing litmus@acid.net.au.